PoyntOS architecture provides an extensible way to add new payment methods (custom tenders). This document describes how a developer can build a custom transaction processor by implemeting IPoyntTransactionService interface to create a gift card app for Poynt. While the scope of this document is to address integration with gift card providers this interface can be used to implement Loyalty, Discount or any other type of service that can create a custom tender transaction. PoyntSamples app has a sample implementation of a custom transaction processor. On a traditional terminal, a merchant would need to select a gift card option before swiping a gift card. Poynt Payment Fragment automatically determines whether or not the swiped card is a gift card based on it’s BIN range and routes the transaction to the custom transaction processor. In addition, based on the configuration of the custom transaction processor you can add a button in the payment options screen of the payment fragment to process a non-swipe input (e.g. scan QR code, manually input gift card number, coupon code, etc). Updating card reader configuration on the terminal. Note: By default Poynt card reader encrypts all track data irrespective of card BIN range. To turn off encrypting track data, please refer to this code example. Please note that this setting will not apply to cards that start with BIN ranges reserved by payment card brands. This configuration file specifies entry methods and the BIN range of the payment cards supported by your application. CARDREAD -> to support card swipe. card data will be directly passed to this capability provider. manual input form, scanning QR code, etc. <!-- value is a first6 digits of card number also referred to as binrange. eval="value &lt;= 736014 &amp;&amp; value &gt;=  700000"
pressing the button will call your transaction service directly. Override processTransaction() to handle SALE, and REFUND (referenced and non-referenced) requests. Please note that the Transaction object you receive here will carry unencrypted track data. Override captureTransaction() to capture an AUTH. If your backend API does not follow auth/capture paradigm, this method does not need to be implemented. Override voidTransaction() to void an AUTH. If your backend API does not follow auth/capture paradigm, this method does not need to be implemented. Override updateTransaction() to adjust an AUTH or SALE transactions (e.g. to add tip or even adjust the base amount). If your service does not support auth/sale adjustment, return a PoyntError. checkCard() should not be used. captureAllTransactions() is currently not used in the Terminal but will be used in the future to request capturing all previously authorized (and still valid) transactions. onResponse(Transaction, RequestId, PoyntError) - processed transaction object otherwise an error indicating why the transaction couldn’t be processed. See below for information on what must be loaded in the processed Transaction object. Note that a processed transaction could be approved or declined. onLoginRequired() - if your transaction processor determines that the merchant session has timed out. This usually happens when your JWT expires. onLaunchActivity(Intent, requestId) - use this callback when you need to collect additional information that is not collected by Poynt Payment Fragments - eg. zip code or cvv. The Intent must carry whatever information you would need to handle UI/UX based on your needs. This intent will be launched as an Activity with result. So it is important that you return a result with 3 Parcelable extras containing “transaction”, “payment” and “error”. 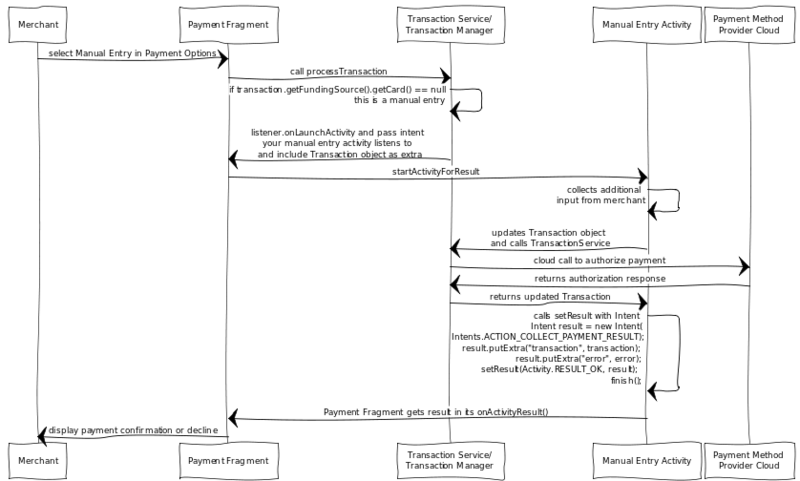 The “transaction” object contains the processed transaction as you would otherwise return in onResponse() callback, “payment” object if you’ve update the payment object based on additional data that you’ve collected, and “error” if the transaction has failed. Use this callback to implement support for manual entry. Tip: Setting Transaction.setSignatureCaptured(false) will skip the signature screen if you don't need to collect signature. // It is always a UUID. // if the remaining balance is provided it will be printed on the receipt. Here’s an example Transaction object passed as an argument to processTransaction in a refund use case. Note that this is not the original sale transaction, but rather a Transaction object that needs to be updated by your transaction service once the refund is processed. Poynt transaction id of the original sale is referenced as the value of parentId in the Transaction object. As you can see, the Refund transaction object contains all references (i.e. processorTransactionId) set during processing the SALE transaction. You can use that id to look up which transaction needs to be refunded on your backend. After you perform the refund by calling your backend, you need to create ProcessorResponse, updating the Transaction object and return it using listener.onResponse callback. // refund transaction id used by gift card provider's backend. Payment Fragment UI allows merchant to specify a partial refund amount. If your gift card service does not support partial refunds and you determine that the amount passed in the refund request does not match the sale amount, you will need to return a PoyntError to the listener. In addition, to a card swipe entry method, you may need to support other entry methods like scanning QR code or entering card number manually. This can be accomplished by adding “CUSTOM” entry method in the capabilities configuration file (please refer to the Transaction Capabilities Configuration section of this document). Adding this entry method will add a new payment option button in the Payment Fragment payment options menu. Note that the Transaction object does not have a nested Card object inside it's FundingSource. // Instruct the Payment Fragment to launch your custom activity. 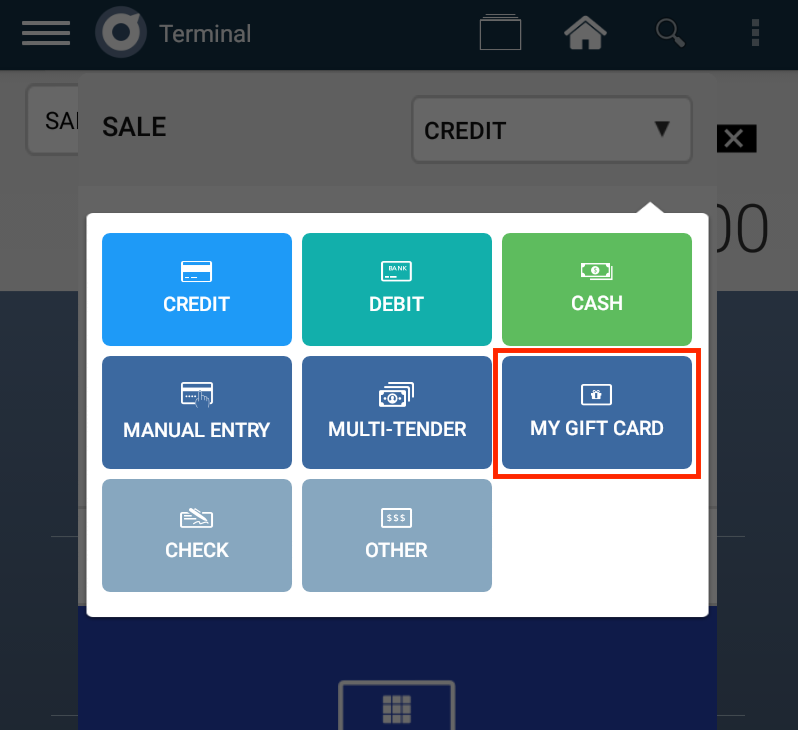 In order to be able to activate, reload or check balance of a gift card your application needs to be able to read card’s track data. This can be accomplished by launching the Payment Fragment with a readCardData only flag. 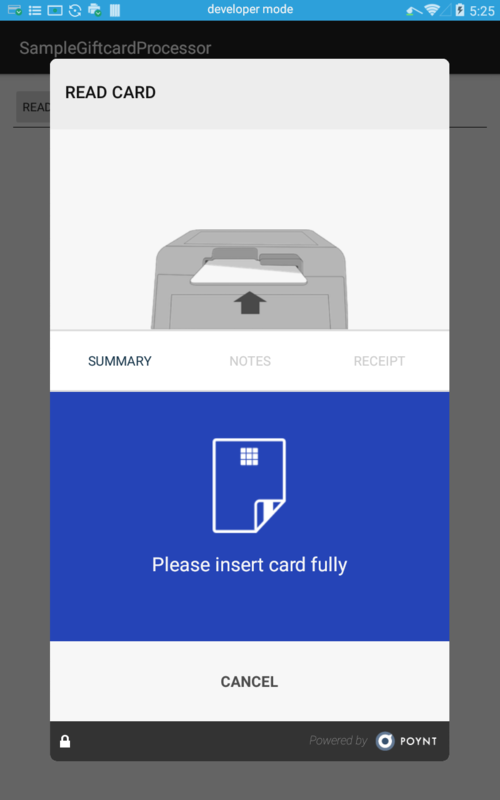 Note that when Payment Fragment comes up and it has no amount and operation type is displayed as READ CARD. In case of a failure other than processor decline, your transaction should return a PoyntError to the listener. Below is a list of applicable error codes that can be set by your application. Why is my custom tender transaction not showing up in Transaction list? Please check the logcat when you create the transaction. The most likely reason is that you are not setting a required field in the Transaction object in which case you would see a 400 error in the logcat with the message explaining which field should be set. Please check the logcat to see if PUT call to record the refund in the Poynt cloud has failed. This could happen if your transaction processor did not set all of the required fields in the Transaction object. The developerMessage in the error response will indicate which required field is not set.